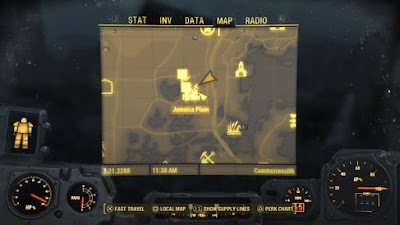 Jamaica Plain is a ruined community in the southeast of the Commonwealth, a somewhat short jaunt to the southwest from the Castle. (Dangerous jaunt, mind, but short.) You’re most likely to come across Jamaica Plain if Preston asks you to settle the area for the Minutemen, though checking computers during missions or pure luck may bring you here as well. You do not have to kill every damned Ghoul to satisfy the requirements of establishing a settlement. The Ghouls near the workbench and the Ghouls in Town Hall seem to do it. That said, you should still try and kill as much as possible, ‘cause the Ghouls in the other buildings can still cause problems for your settlement if they wander out and happen to notice you. You can access the church by entering the house next door, climbing to the top floor, and crossing the boards up here to drop into the roof. The church is too crazy in terms of collectibles, but if you look near the front door, by the Cooking Station, you’ll find the corpse of a dude named Luke Silverhand who’s carrying a Jamaica Plain Flyer, a Silverhand’s Note, and a Jamaica Plain Mayor’s ID. There’s a concrete barrier on the east side of Jamaica Plain in the middle of the road. The body of one Carl Everett is slumped here, and he carries the Jamaica Plain Town Hall Key and Carl’s Log. There’s a steamer trunk packed with goodies on the second floor of the Town Hall. Also here is the corpse of a dude named Sal, and he’s carrying the Jamaica Plain Mayor’s Password and Sal’s Holotape. Also, lots of pretty awesome Combat Armor. You can use the Password to unlock the mayor’s terminal on the first floor, which in turn opens a nearby wall safe. Both are normally Expert level cracks. Unlock the Master door on the left side of the meeting room with the podium. In the very next room you can find a Jamaica Plains Archives Key, on a desk beside the door, as well as an Expert safe. A hallway beside the safe leads past the lasers. Either way, you’ll wind up in a room with two Protectrons and a big ‘ol security door. Use the Mayor’s Password on the computer in front of the door to pop it open. Beyond another security door is a small display room. On the table directly ahead you’ll find two Holotapes - The Treasures of Jamaica Plain and Treasures Inventory - as well as Holotape Instructions. Everything else here, despite the grandeur, is junk - save, that is, for the 2076 World Series Baseball Bat sitting in the display case on your right. It’s a pretty cool melee weapon. 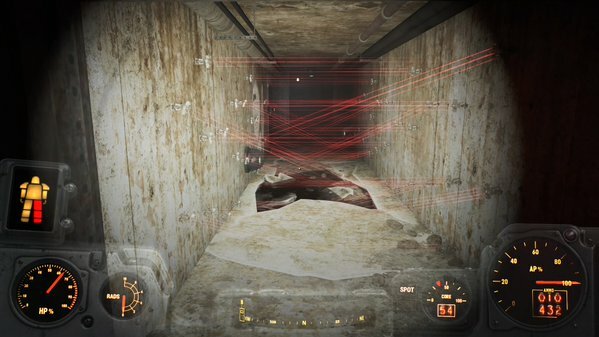 The infamous laser hallway of Jamaica Plain in Fallout 4. Keep companions away from this thing. Yes, not much junk, Supply Line is good. That said, there is a fair amount of junk in the rest of the town, particularly in Town Hall. If you’re willing to go on a junk run or two you can get lots of rarer resources. Wood is still pretty much import-only, however. The tiny lot helps in one respect: you have an obvious choice for a building. The two burnt-out structures here are great for setting up bedrooms, once you patch up the roof above the Workbench a bit. You could also ignore them completely and use the parking lot for all of your housing needs. The parking lot is also an awesome place to centralize your defences. Set up Turrets here and they can draw in enemies from just about every angle. The tops of the three existing buildings aren’t bad for this either, if you’d rather spread out your defence. Speaking of defence, the closed building seems kinda useless at first glance, but it can serve as a handy wall. Set up a blockade between it and the other buildings and you’ll force attackers to go around, making your Turrets’ jobs even easier.